I went to Tiny House Ontario over the weekend and drove in to see my grandma Violet Rickards. Grandma is approaching 90 and recently, feeling slowed down and tired. On the route in, I took Rideau Street, ironically, where grandma’s brother, Frank Compton (Punky) lived in his Tiny House when I was a young girl. Great Uncle Frank worked on the big ships and due to this work, he grew accustomed to small spaces and when he finally hit land he never changed that way of living. He bought a Tiny House and lived there until the end of his life. When I was young, I loved to visit Great Uncle Frank. He allowed me to open the cupboards and look around. Not only that, he encouraged me to explore. He would say “there is a treat somewhere, and you will have to find it”. Or, go lift up the latch in the closet and see what is down in the cellar. In retrospect I suppose that this allowed him to have a grown up visit at his Tiny House, but when I was a kid, I did not see it like that. What I saw was that I was allowed to to exactly what I wanted to do when I visited him. 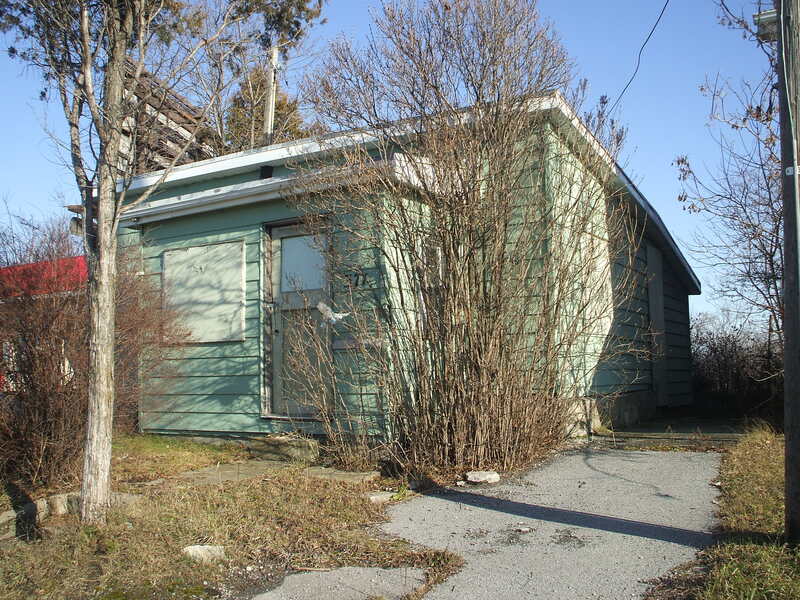 This Tiny House at 371 Rideau Street in Kingston Ontario, sits empty. It was never what one would call a fancy house but all a single person needs to live comfortably. It had a quirky but functional bathroom, a decent sized kitchen, a small bedroom with a closet (where the basement entry latch was in the floor), and a little sitting room too. The coolest thing about this tiny house is that it also has a really good sized shed and a back yard that is a great size and which overlooks the Rideau Canal, he kept his horse there. It is a great, conveniently located, spot except that the street is somewhat busy and there is an industrial welder who is housed across. Still, it sickens me to see this Tiny House sit empty in a world where so many people are homeless. No reason why this could not be tidied up again and made into a house that someone could call home. When I was a young single mom, I would have loved to have had this tiny house to live in, still would! Today, when kids in the neighbourhood of Tiny House Ontario come to visit, and they do come… I do just as Great Uncle Frank did. I tell them to look around, open things up, go upstairs and see what I have done up there. I encourage them to look for hidden treats and also to tell me about themselves. I very rarely have grown ups there when they come, so I don’t really care about adult conversations, and maybe Great Uncle Frank did not either. Perhaps, just perhaps, it is just as it should be and he was truly Great Uncle Frank, just as he was called.